An enamel brooch in the shape of a hare, which inspired our logo. The excavated material involves a wide variety of specialists who are introduced in this section of the website. The Town Life project is an ongoing excavation of one block of the Silchester Roman Town by the Department of Archaeology at the University of Reading. This block is called Insula IX. Our choice of Insula IX was determined by a number of factors. Recent aerial photography and geophysical survey had shown that more buildings existed here than had been originally identified by the Victorian excavators in 1893. 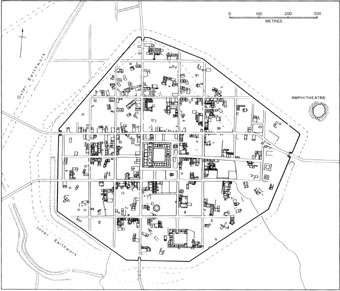 The Antiquaries' plan of Silchester. Insula IX showing cropmarks in green and the area of the current excavation. There were also apparently 'blank' areas, where neither the excavation of 1893 nor subsequent aerial survey had revealed structural remains. Our excavation offers the opportunity to see if these 'blank' areas contained timber buildings. 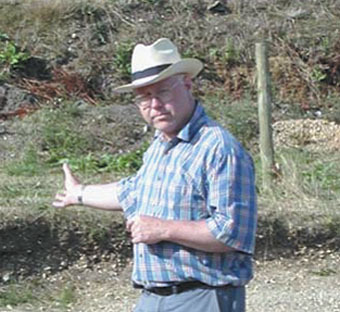 Michael Fulford - Project director and Professor of Archaeology at the University of Reading. Mike has been excavating at Silchester since 1974. 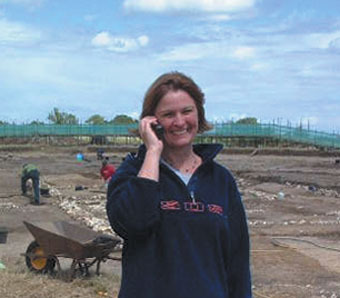 Amanda Clarke - directs the Field School and co-directs the excavation. She is an experienced field archaeologist and has a particular interest in delivering training in field techniques. The Insula IX excavation lies within the boundary of the earlier Iron Age settlement but also contains the find spot of one of the latest artefacts found by the early excavators - the Silchester Ogham stone. This area also contained a building on a different alignment to the street grid, hinting at an earlier layout. Fresh excavation offers the possibility of discovering the story of the development of the insula from the earliest occupation, and of investigating the reasons for the abandonment of the town. In 2002 the project reached the end of its sixth, six-week season of excavation. We believe that this marks the half way stage of the project and that the excavation will conclude in 2009. Already we have made substantial advances on what was understood at the time of the original excavation of this area in 1893-4. 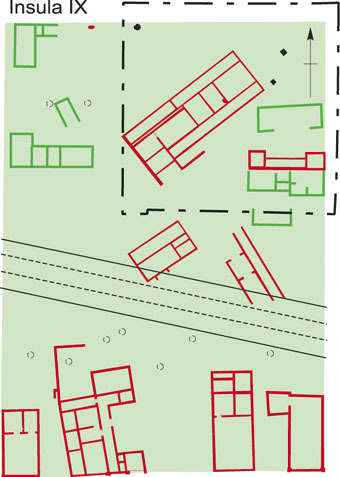 We have added evidence for both masonry and timber buildings to the early excavators' plan and we can see clear differences between the early and late Roman layouts, none of which is discernible from the early records. Our understanding of the later Roman occupation, from the late third century, is very well developed. 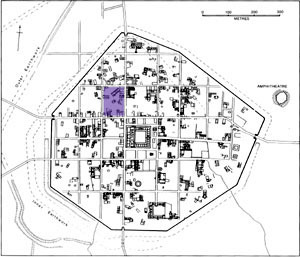 We are also well advanced in our understanding of buildings and activities within the insula from the time of its creation when the Roman street grid was established. In contrast, while we can be reasonably confident of extensive evidence of the earliest occupation, from the later first century BC, we will only reach levels of that date across the site as the excavation progresses. However, our work on the large town house (House 1), which lies diagonally across the layout of the later block, has given us considerable insight into Calleva in the first century. Over the remaining seasons we will concentrate on unravelling the early history of the area, going back in time through the second and first centuries AD to the earliest occupation. Whiteknights, Box 227, Reading RG6 6AB.